If you have recently planned a trip to Milan, then you should slowly book airtickets. Visiting the Italian fashion mecca is the best at the end of January - when discounts accumulate. Other times overpriced pieces can afford to buy at this time almost everyone and without undue remorse. Milan can be best reached by air with low-cost airlines like EasyJet and Wizz Air. The best airport is Linate Airport, almost right in the city center, but not many airline companies land there. Much more likely you will land either at Malpensa Airport (about 49 km northwest of Milan) or at Orio al Serio Airport, known as the Bergamo (about 45 km north east of Milan). For hotel reservation (and orientation in general) take as a starting point Duomo di Milano. It is not only a beautiful architectural monument, but mainly stands in the square of Piazza del Duomo in the city center. Choose a hotel as close as possible to this square, ideally within a 5 Metro stops away. The most famous shops are in its surroundings. Once you got your hotel room, you can go shopping. The focus of your interest should be Quadrilateral - golden quadrilateral of fashion lined with the streets of Via Monte Napoleone, Via Sant'Andrea, Via della Spiga and Via Alessandra Manzoni north of the cathedral. In this relatively small passage full with the most famous world brands like Armani, Dolce & Gabbana, Gucci, Versace or Prada you will most likely please only your eyes, as the clothes are quite expensive and an average person cannot afford it. But who knows - maybe you will find here a nice discount too. However, most often you will open your wallet at Via Torino, Corso Buenos Aires, Corso Vittorio Emanuele and Corso di Porta Ticinese. In dozens of shops you will find everything you need for your life. If you do not prefer to walk too much, right next to the cathedral stands eight floor department store La Rinascente, in which you could purchase everything from food through perfumes and toys to clothes. Also noteworthy is the famous vintage shop Cavalli e Nastro, which is maybe the inspiration of every fashion guru from Milan. And if you want to shop for a really great price, visit the outlet center - Fashion Outlet Il Salvagente, or one of the big outlets around Milan - Serravalle, Vicolungo or Foxtown. It's worth it. Ak ste v poslednej dobe plánovali výlet do Milána, potom by ste pomaly mali rezervovať letenky. Navštíviť taliansku Mekku módy je totiž najlepšie na konci januára - vrcholia tu zľavy, akcie a výpredaje. Inokedy predražené kúsky si v tejto dobe môže dovoliť kúpiť skoro každý a bez zbytočných výčitiek. Do Milána sa najlepšie dostanete letecky – svoje airbusy sem posielajú napr. nízkonákladové spoločnosti EasyJet a Wizz Air. Najlepší z letísk je Linate Airport takmer priamo v centre mesta, ale sem moc spoločností nelieta. S oveľa väčšou pravdepodobnosťou pristanete buďto na Malpensa Airport (cca 49 km severozápadne od Milána) alebo na Orio al Serio Airport, známom ako Bergamo (cca 45 km severovýchodne od Milána). Pre rezerváciu hotela (a orientáciu všeobecne) berte ako východiskový bod milánsky dóm – Katedrálu Narodenia Panny Márie. Tá nielen, že je prekrásnou architektonickou pamiatkou, ale hlavne stojí na námestí Piazza del Duomo priamo v centre mesta. Hotel si vyberajte k tomuto námestí čo možno najbližšie, ideálne v okolí do 5 zastávok metrom. Väčšina vyhlásených obchodov je totiž v jeho okolí. Akonáhle budete bývať, môžete vyraziť na nákupy. Stredobodom vášho záujmu najskôr bude Quadrilateral - zlatý štvoruholník módy lemovaný ulicami Via Monte Napoleone, Via Sant'Andrea, Via della Spiga a Via Alessando Manzoni severne od katedrály. V tejto relatívne malej pasáži plnej Armaniho, Dolceho & Gabbany, Gucciho, Versace alebo Prady pravdepodobne potešíte hlavne oko, pretože oblečenie je tu celkom drahé a priemerne zarábajúci človek si ho dovoliť nemôže. Ale ktovie – treba aj tu narazíte na peknú zľavu. Oveľa častejšie však svoju peňaženku budete otvárať na Via Torino, Corso Buenos Aires, Corso Vittorio Emanuele alebo Corso di Porta Ticinese. V desiatkach obchodov tu nájdete všetko, čo pre svoj život potrebujete. Keby sa vám náhodou nechcelo veľmi chodiť, priamo vedľa katedrály stojí osemposchodový obchodný dom La Rinascente, v ktorom nakúpite všetko od jedla, cez parfumy a hračky, až po oblečenie. Za zmienku stojí tiež slávny vintage obchod Cavalli e Nastro, kam chodí pre inšpiráciu snáď každý módny guru z Milána. A ak chcete nakúpiť za naozaj super ceny, stavte sa v outlete Fashion Outlet Il Salvagente, prípadne v niektorom z outletov v okolí Milána – Serravalle, Foxtownu alebo Vicolungu. Stojí to za to. Milán znám a moc jsem si tam nákupy užívala. Nyní se mi nikam příliš nechce. Mám obavy po zážitku z Drážďan. Co se stalo v Drážďanech? I've always wanted to visit Milan and do some shopping there. :) Great post! Great tips! Will you post what you bought? :) I would like to see some. Happy New year!!! I've never been to Milan, but I've always thought of it as a great shopping spree city. Thanks for the info, really helpful. Happy New Year! I have wanted to go to Milan for a very long time! Thanks for the tips! Would love to visit Milan! I really enjoyed this post..it was really interesting. Due to poor health, I will never be able to travel. But I love reading about the places that I would just love to visit. For bringing me to this place not physically but for the total experience , thank you! It has been my childhood dream to travel to this place, Milan! I love Milano, cute city!! Ótima dica ,que imagem linda do Shopping . Snad se tam jednou podívám! 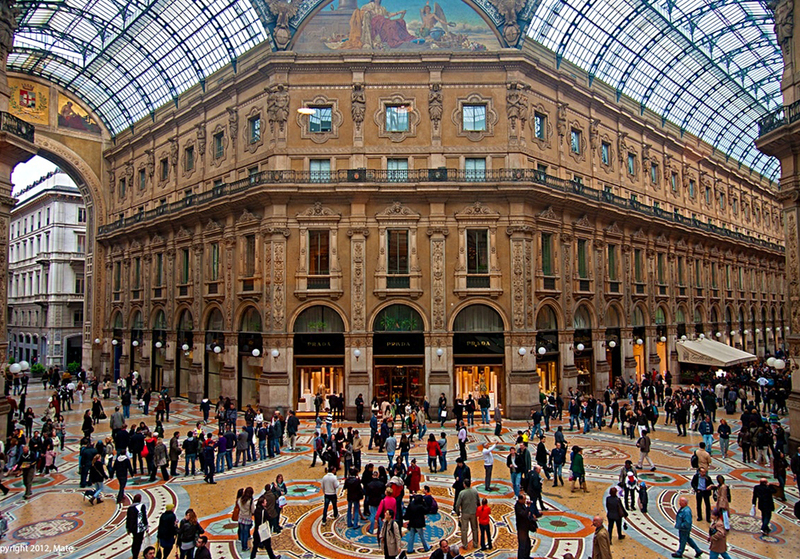 Milan sounds like a shopping heaven, and I will be putting a visit there, in January on my bucket list. Made in Italy means high quality, i like to shop around in Milan for stylish dresses. I've always wanted to visit Milan, thaks for the tips. What a dream to go there! On my bucket list! I have wanted to go to Milan for a very long timeee! One day I'll go, thank you for the great advice. And the beautiful photos! Some day I will visit Milan, its a dream. I would like to visit Milan. Interesting post for a wonderful city! I would love to take the wife shopping in Milan. Great post and tips ! One of my dream destinations is Milan, hope one day I can go and shop there. Milan is the unique place for shopping, my wife just driving crazy when we came to Italy. But I don't like the taxi services there, I think the most useful and comfortable is online taxi service http://kiwitaxi.com/Italy/Milan+Malpensa+Airport you can look for the prices and choose the car you need, I think it's the best online taxi service in Europe. Gorgeous city! Thanks for these tips again madam! This looks amazing, I would love to travel there.